Ever since I posted the recipe for Butter Chicken on my blog, I was inundated with a number of emails, some thanking me for the recipe, some tried it out and wrote back to tell me how well it turned out. To me, that’s the best part of being a food blogging; the effort of carefully selecting a particular recipe, working on it till it’s perfected and then attempting to get the best clicks; this process comes a full circle when you, my beloved readers tries a recipe and writes back with feedback. The joy is unparalleled. I have always wanted my blog to inspire people not just to cook, but to fall in love with the process of cooking. Inspiring, yet not intimidating is the overall objective of each recipe. Some are simpler, some are slightly longish and tend to take longer to cook, but not many things are as satisfying as cooking a lovely meal and sharing a few good laughs with the family, correct? Today’s recipe then, is a simple recipe. Believe me, its so simple I would imagine almost leaving it out from the shortlist of recipes to be put up. But honestly, its quick, no fuss and extremely high on the taste quotient. 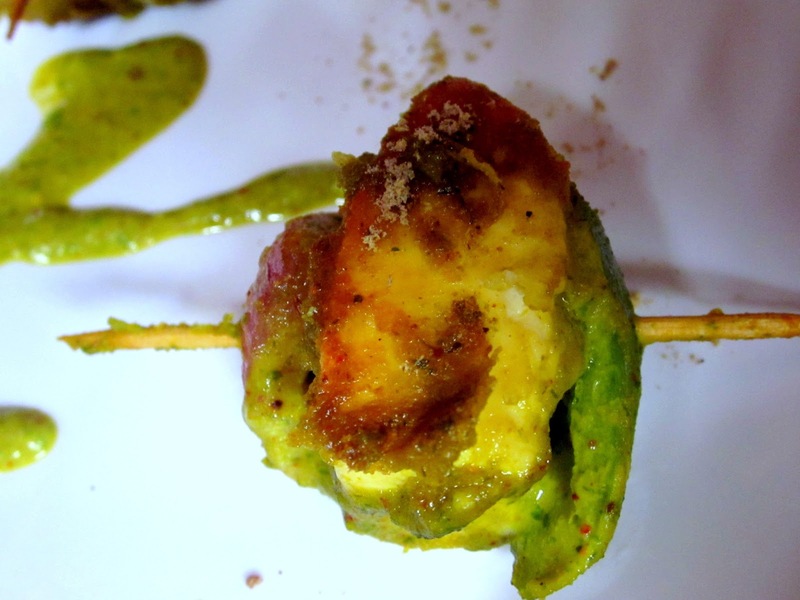 The Hariyali Paneer Tikka is a dish that makes an appearance at almost every function or party. Cubes of Paneer coated with a spicy green marinade and most often accompanied by cubes of onion and capsicum. Seems simple, correct? Believe me your family and guest will not have enough. Paneer has an innate versatility to it. The ability to blend or combine with almost every ingredient and somehow produce magical results. All you would need is some creativity and I bet, you would create a new dish each time you work with it. 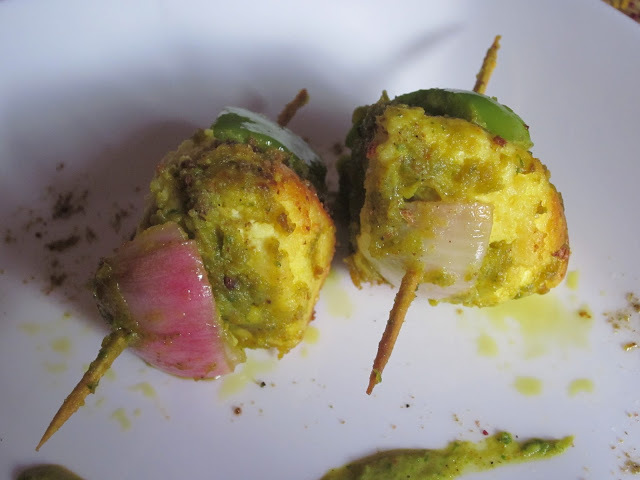 While we are on the topic of creatively using Paneer, here is an interesting blog on Interesting Twists to Paneer by my good friend Perinaaz Avari of Peris Spice Ladle; and whilst you are there do not miss the mind blowing collection of Parsi recipes and much more. I am sure you will love her website. And so, here too, the spicy green marinade does most of the talking. Its bright green, fresh and spicy just what an appetiser should be. The actual recipe doesn't use besan, though i did to give the marinade a little more body and texture. Another thing i changed was that i used tooth picks instead of regular skewers, really found them more convenient to pick and eat. My suggestion is dont cook the Paneer too much, just enough to char it on all sides. This ensures that the Paneer is not over cooked and rubbery. I do hope you will like and enjoy this recipe as much as i did presenting it to you. Cut the onion and capsicum into cubes and keep aside. Wet the toothpicks in some water and remove. Combine all the ingredients mentioned under head "grind to paste" and grind in a blender till it reaches a creamy consistency. Empty in a bowl and keep aside. In a non stick pan, heat 2 tablespoons oil and fry the besan till it has the consistency of wet sand. By now it should release a nutty aroma. Add in the ajjwain seeds and mix well and take off the flame. Now, combine both the curd and besan mixtures. Mix well. Add the ginger paste, garlic paste, the turmeric powder, garam masala powder and mix well. This is the hariyali marinade. Heat the oil (for frying) in a non stick pan. Now, pick an onion cube and coat well with the marinade. Line on a toothpick. Similarly, coat a paneer cube and line on the same toothpick. Follow this with the marinated capsicum. Continue this sequence for the remaining cottage cheese cubes. The cottage cheese cube should be in the center and the onion and capsicum cube on either side. Fry the cubes in the oil for 2 minutes a side. Remember, we need the golden brown char on all sides of the cubes. Garnish with lemon juice, drizzle some chaat powder and serve hot.